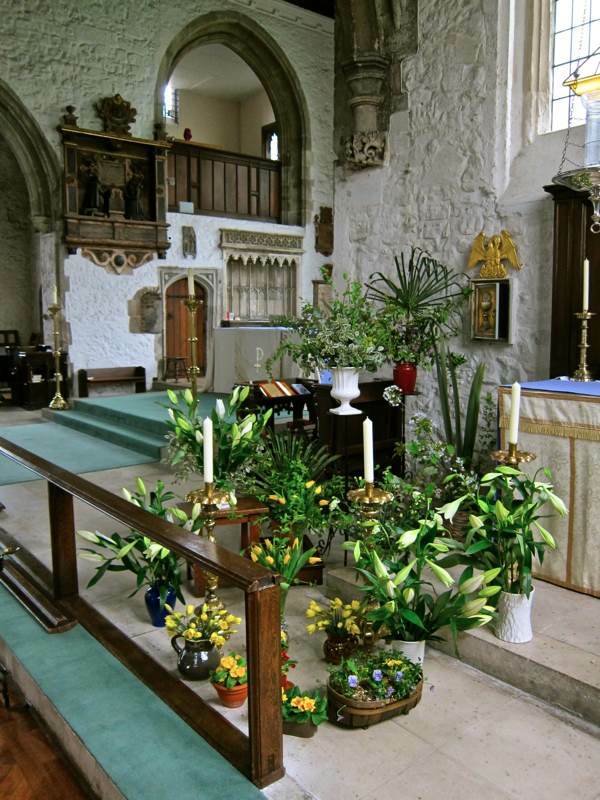 Last year, when Vera Hullyer told me about the Easter display which is the climax of the year in floral arrangement at St Dunstans, Stepney, I knew I had to return and see it for myself. And, arriving in the octagonal parish room at the rear of the church on Maundy Thursday, I discovered Vera and her long-time collaborators, Sarah Edwards and Maureen Gilbert, surrounded by fresh cut flowers and greenery, rather in the manner of those three nymphs frolicking in Botticelli’s painting of the harbingers of Spring. 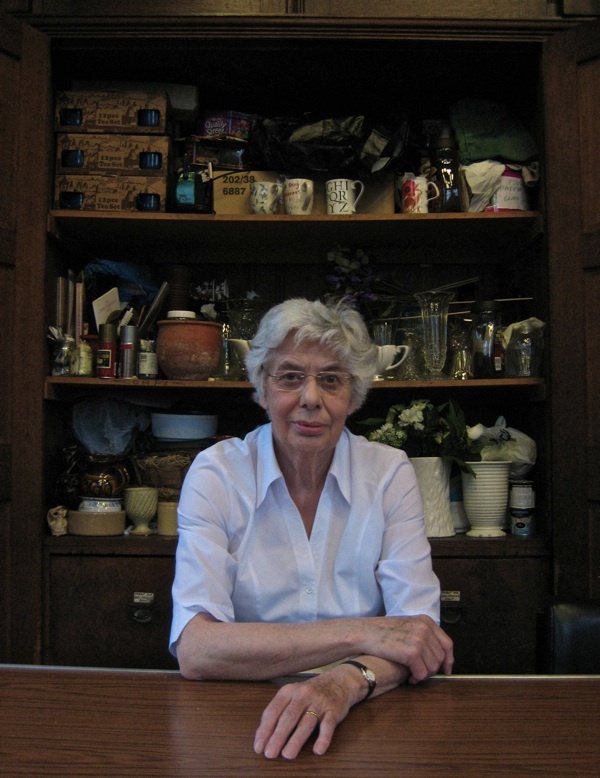 “I used to help Joyce Graham, until she got too old to do it, and then it was handed over to me,” admitted with Vera with a self-deprecatory laugh and wielding a sprig of Hornbeam freshly picked in Tower Hamlets Cemetery Park that morning, confessing, “I’ve been doing it at least twenty years.” Although Vera, Sarah and Maureen do Christmas decorations and regular displays every Friday in the church for forty weeks of the year, they were in agreement that Easter was “the big thing,” and a sense of excitement pervaded. 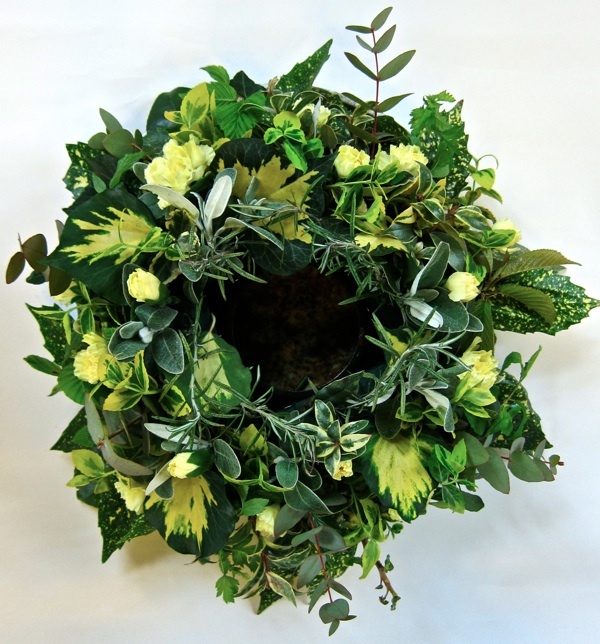 Reflecting the season, the colours were green and white with highlights of pale yellow, with cut flowers supplied by Joanne the florist of the Roman Rd and greenery from the gardens ands parks of the East End. 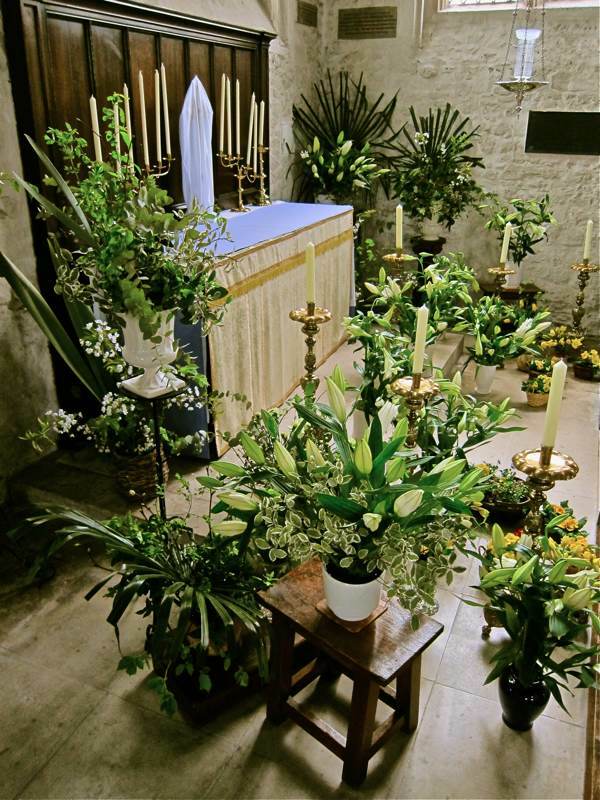 “The lilies are donated in memory of people and the list of names is placed on the altar.” explained Vera, to underline the gravity of the conception and lifting yet another vase to carry through to add to the epic display at the Altar of Repose in the south aisle. 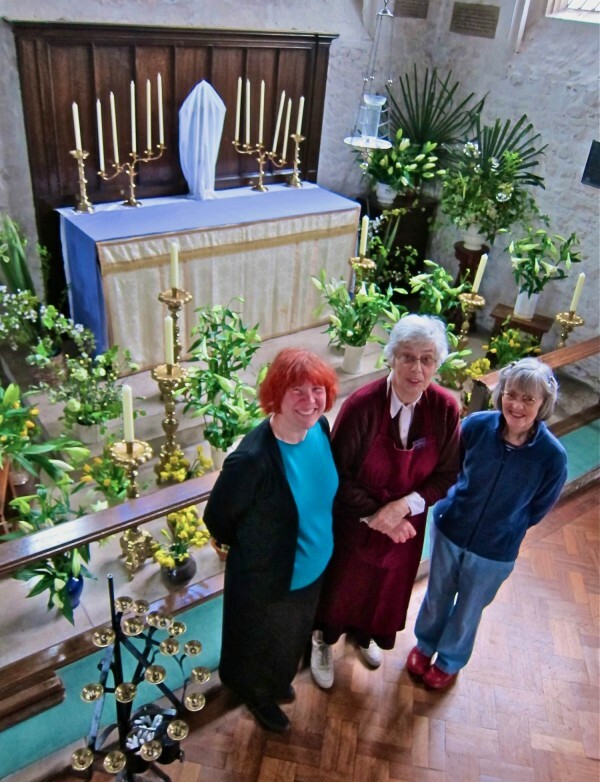 As we stood in front of the magnificent array of flowers, the vividness of their living quality emphasised by the ancient stonework of the church, Vera explained the iconography of her display which represents the Garden of Gethsemane and is complemented by candles, lit to burn through the night watch by parishioners until Good Friday, when the flowers are removed from the church to be brought back on Easter Day as a representation of the Garden of Remembrance. Begun by St Dunstan himself in 952, St Dunstans is the second oldest building in Tower Hamlets after the Tower of London and was once the parish church for entire borough, standing today both as a reminder of the East End’s distant rural past and of its relationship with the sea – as the mariners’ church, it still flies the red ensign today. Whilst I had been admiring the ladies’ handiwork. the dignified churchwarden Julian Cass hovered in the background and he took this moment, while the floral display received its finishing touches, to suggest I might like to accompany him up the tower. 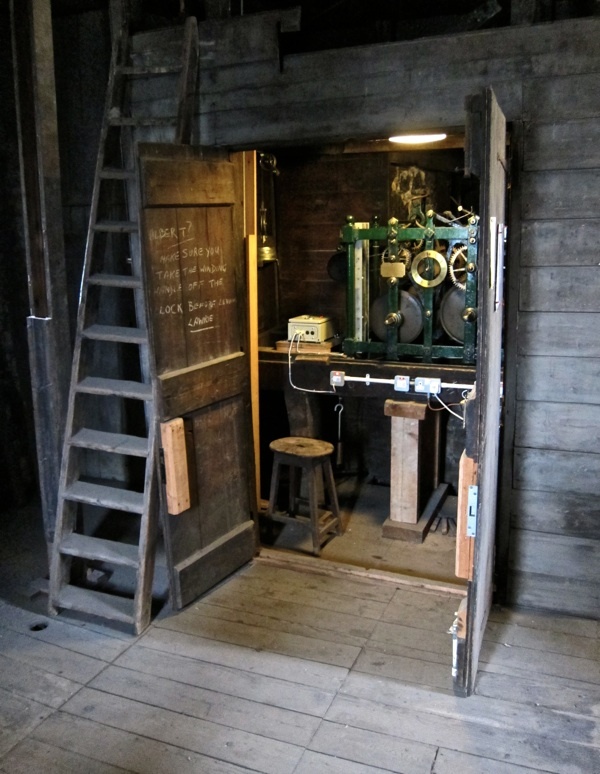 Above, we entered a dusty chamber with an ancient lapboarded shed which contained the clock of 1805, now powered by electricity. As a reminder of when it was wound weekly, another arcane sign remains here, “Albert? Make sure you take the winding handle off the clock before leaving.” On the top floor, Julian and I clambered like spiders within the metal web of the bell frame where the legendary bells of Stepney hang, – cast in Whitechapel in the era of the Napoleonic Wars – before we emerged onto the tower roof, with views through the haze across the expanse of the East End to Canary Wharf in one direction and the City in the other, where once there was just fields. For over a thousand years, Easter has been celebrated here at this modestly proportioned old stone church, and when I returned around midnight, I found it in darkness, save the candles illuminating the display at the Altar of Repose with a pale glow, in contrast to the rays of the full moon casting the nave in a cool blue light. 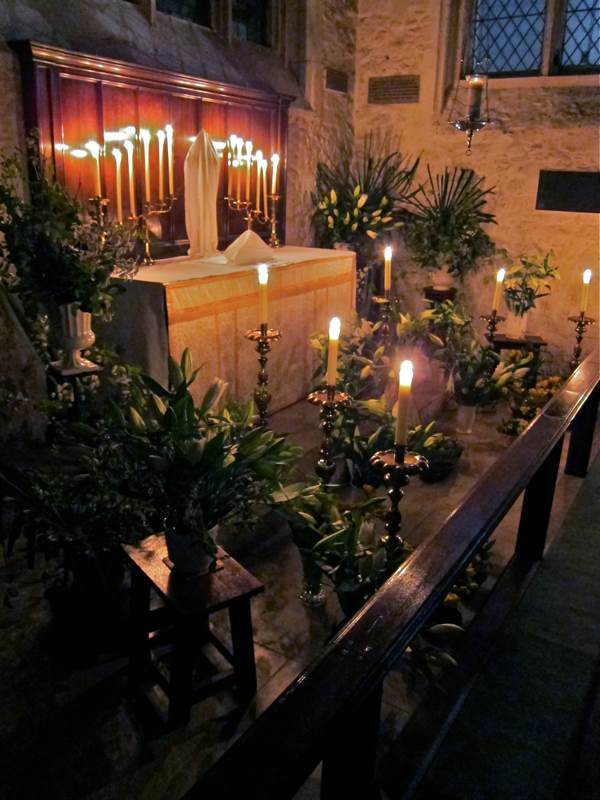 Spring flowers glowed by candlelight that burned through the small hours while parishioners undertook their silent watch and the dawn rose over the East End on another Easter, welcoming the change of season after the long winter. 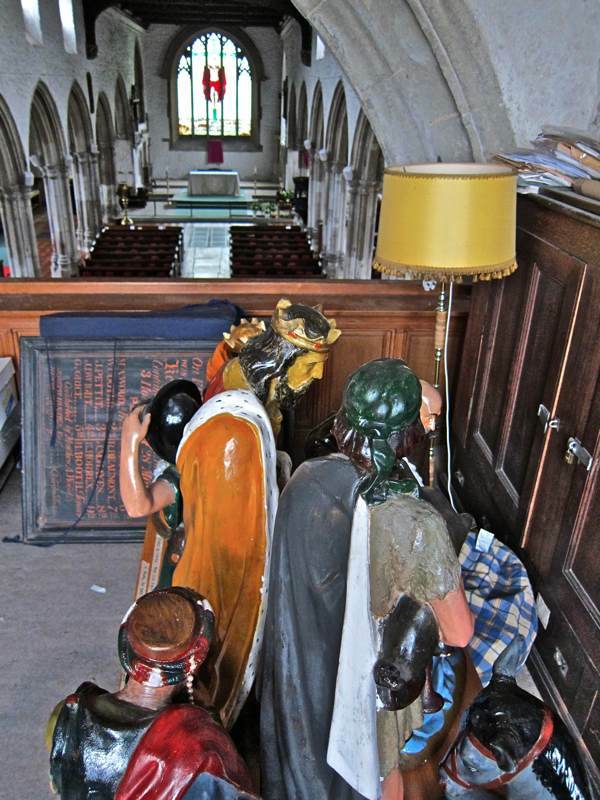 These nineteenth century nativity figures are stored away in the loft until next Christmas. 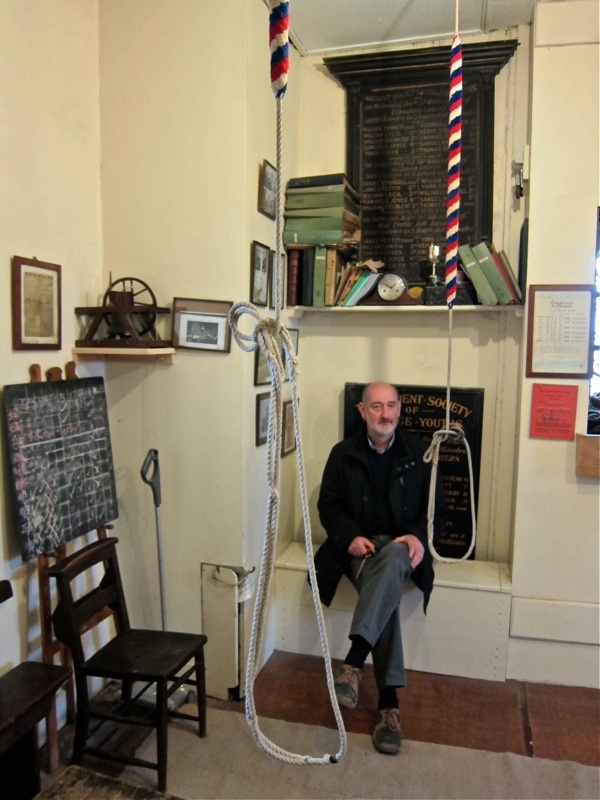 Julian Cass, church warden, in the ringers’ chamber in the tower. The clock cupboard in the tower. 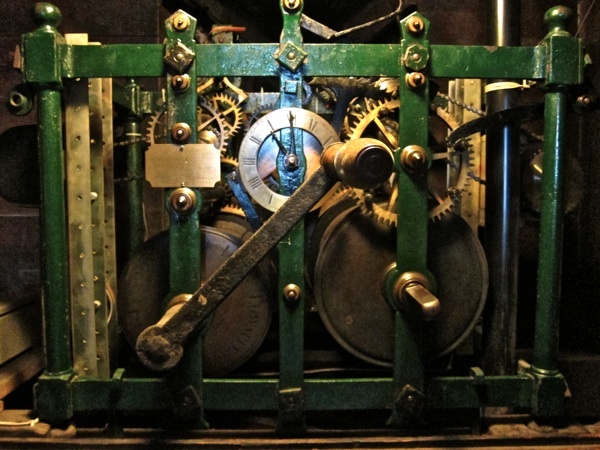 The church clock was made in Clerkenwell in 1805. 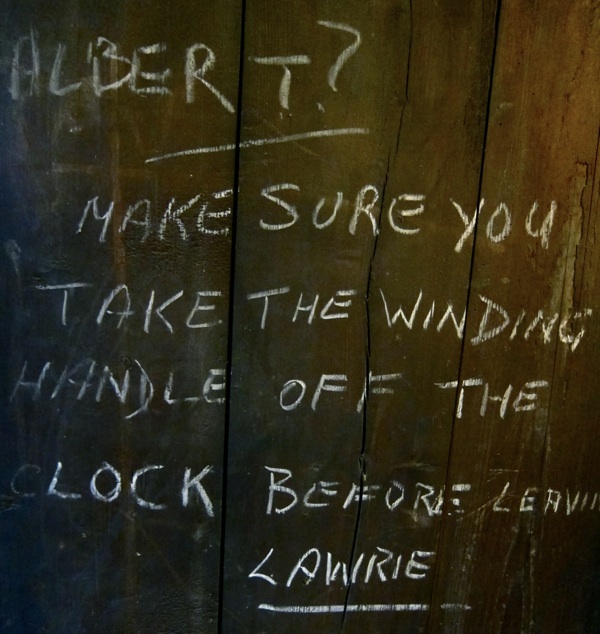 This graffiti on the door of the clock cupboard was written so long ago that no-one knows who Albert and Lawrie were. 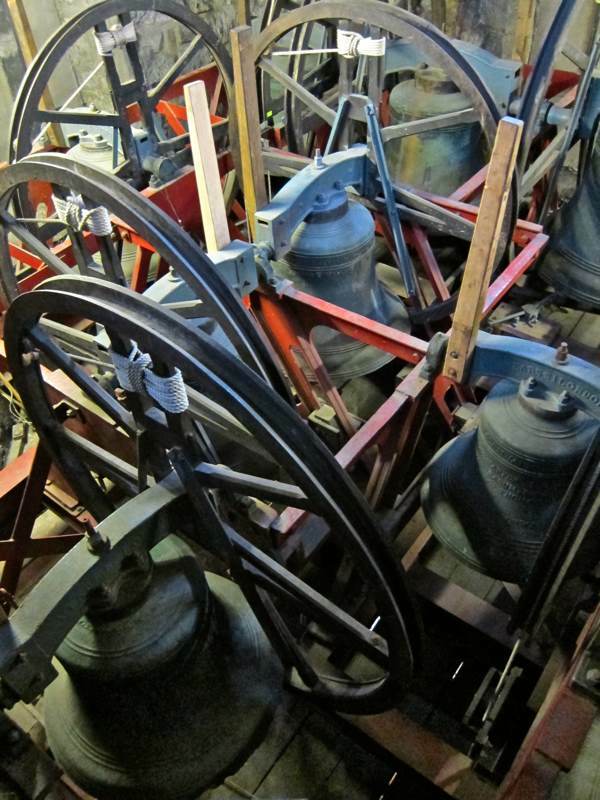 The famous bells of Stepney were cast in Whitechapel during the era of the Napoleonic wars. Looking towards Canary Wharf from the tower. The finished display, with lilies paid for by parishioners in memory of their loved ones. During the night’s vigil from Maundy Thursday to Good Friday. Paschal candle ring by Maureen Gilbert. 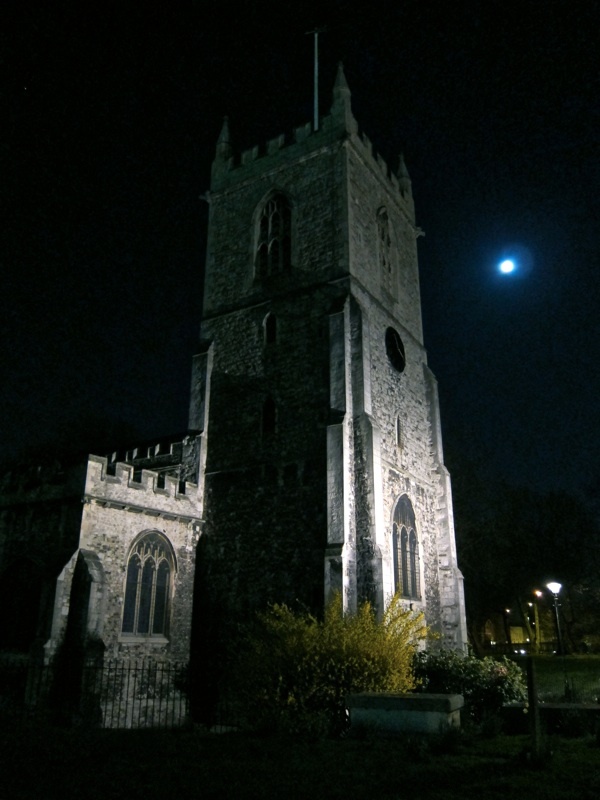 Full moon over St Dunstans on Maundy Thursday. Thank you for sharing these beautiful flowers in this historic church. My son and I visited St Dunstan’s for their service last Michaelmas (29 Sept) and were made very welcome indeed by the clergy and what was quite small congregation at that particular service. I met Vera and certainly recognised her straight away. 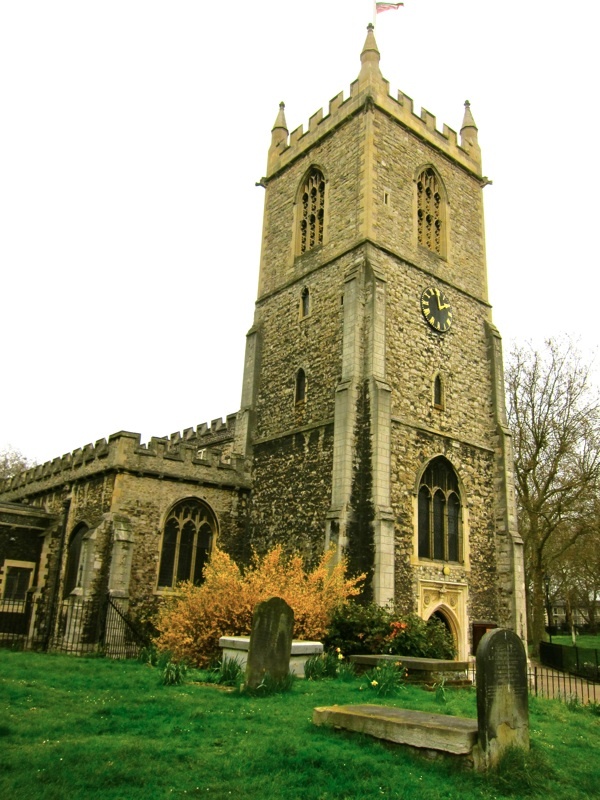 My 4 x great-grandparents were married in this church in November 1815 and it was a privilege to share the space with the current worshippers. oh this one is a killer. the moonlight in the church; the view from the top where once there were only fields…..the beautiful foliage in the candle ring. thank you. I had no idea St. Dunstan’s was as old as this. 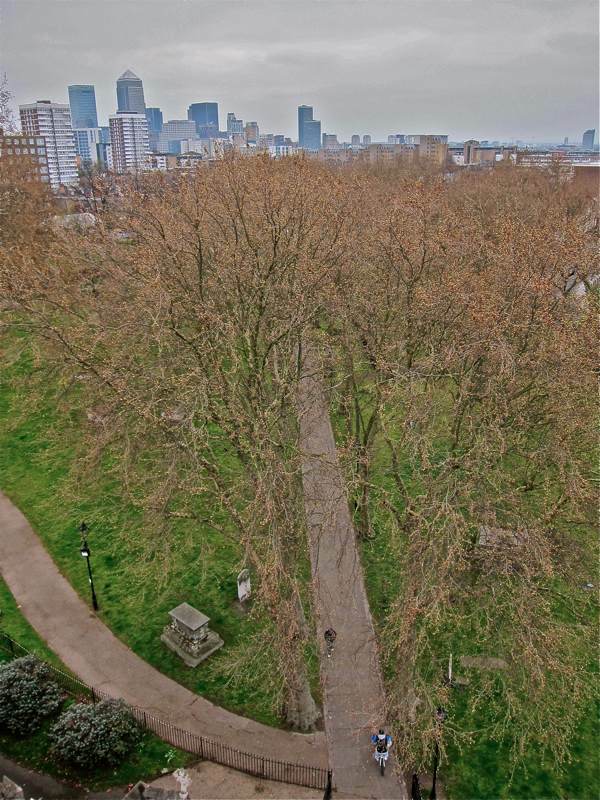 I remember playing here as a child – around the graves! We moved from Stepney 43 years ago but I remember my sister trying to frighten me. I loved the sound of the bells on Sunday mornings. This book has made my day, I’ve been tracing my ancestors for twelve years now and now i can see where and how they lived, i have quite a big generation that were married christened and buried at St Dunstans too its great to see the pictures of the church especially as it isn’t easy for me to travel, my family go back to the Huegenots that lived and worked in the area thank you so much for a wonderful book .